Rebecca Sisler. Art for Enlightenment: A History of Art in Toronto Schools. Toronto: Fitzhenry and Whiteside, 1993. Pp.280. Panayotidis, Lisa. 1995. “Rebecca Sisler. Art for Enlightenment: A History of Art In Toronto Schools. Toronto: Fitzhenry and Whiteside, 1993. Pp.280.”. 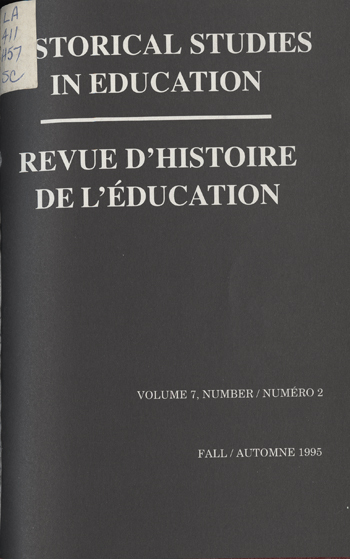 Historical Studies in Education / Revue D’histoire De L’éducation 7 (2), 263-66. https://historicalstudiesineducation.ca/index.php/edu_hse-rhe/article/view/1401.